Sub: Implementation of the recommendations of 7th CPC – Fitment Factor and Pay Fixation for Running Staff (@ 14.29%)-reg. Ref: (i) NFIR’s letter No. IV/NFIR/7 CPC (Imp)/2016/RB dated 04/08/2016, 23/08/2016 & 13/09/2016. 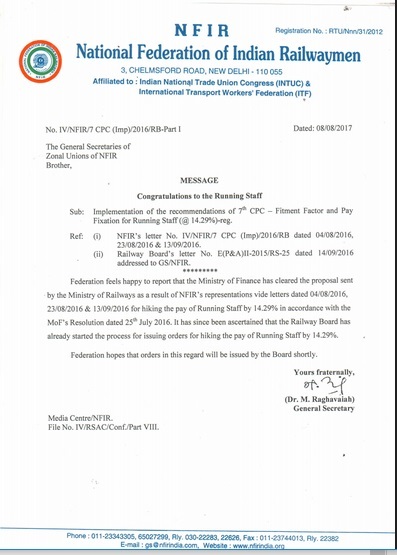 Federation feels happy to report that the Ministry of Finance has cleared the proposal sent by the Ministry of Railways as a result of NFIR’s representations vide letters dated 04/08/2016, 23/08/2016 &.13/09/2016 for hiking the pay of Running Staff by 14.29% in accordance with the MoF’s Resolution dated 25th July 2016. 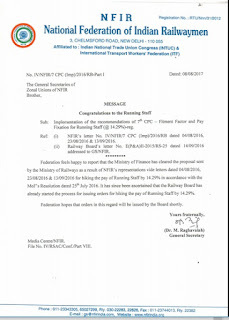 It has since been ascertained that the Railway Board has already started the process for issuing orders for hiking the pay of Running Staff by 14.29%.